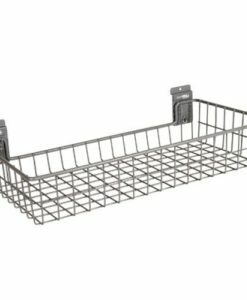 StoreWALL baskets are an ideal storage solution for anything that is frequently used …and must be readily accessible. Baskets are perfect for sports equipment, tools, or even that left over extra roll of tape. And don’t forget about your muddy shoes and boots. Our angle shelf fills the bill quite nicely. storeWALL Heavy Duty baskets and angle shelf are made to withstand daily use and abuse. Baskets are powder coated for a long life. Heavy gauge industrial grade steel is used throughout. Each basket and angle shelf is equipped with our exclusive CamLok to prevent accidental dings and drops. Grab and Go Bags are made of mesh for easy visualization of what is being stored plus the added benefit of air flow if you are storing sports equipment. The top of each of our three bags comes with a convenient draw string to truly Grab it…and Go!